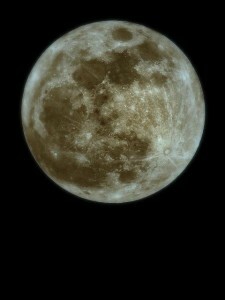 Last night (May 5) was the unveiling of this year’s supermoon. Astronomer Richard Nolle coined the term supermoon in 1979 and basically it is that time each year when a full moon or new moon (dark moon) is closest to Earth. Of course if it were a dark moon we wouldn’t see it, but last night’s supermoon slipped in and out of the clouds all night. I was working at the computer when I noticed the glow through the window. I went upstairs where Mom was reading to the girls and told them the supermoon was up. We wrapped babes in blankets and got outside just in time to see the big ole moon slide behind a cloud, ringing the edges of it in yellow light. That’s the last I saw of the supermoon in the P.M., but I had to get up in the predawn and head to the Nantahala Ranger District to search for cerulean warblers. When I hit the Great Smoky Mountains Expressway (U.S. 23/74) there, in front of me, was supermoon glowing in the clear sky. I would zig and supermoon would zag behind the Plott Balsams. Then I turned south on U.S. 23/441 and supermoon darted behind the Cowee Mountains. When I crested Cowee, supermoon was showing off, dancing over the Little Tennessee River Valley. I’m sure it was guiding migrants to their nesting grounds, showing redhorse in the river the best shallows for spawning and pointing out the juiciest Euonymus to the whitetails as they browsed. As I approached Franklin, I thought supermoon was playing with sparklers but remembered that this weekend was also the peak of the Eta Aquarid meteor shower. I saw three sizzling shooting stars in the span of about 10 minutes. Sure, there would have been more without supermoon, but to see them together just made it better. I headed out of Franklin on U.S. 64 and supermoon was once again, unabashed and in full glory. But to get to the plots I was surveying I had to duck off 64 onto Wayah Road and into the forest. Peek-a-boo started again with forests and ridgetops between supermoon and me. There were a couple of places at the beginning of Wayah Road where supermoon danced, once again over farm field and meadow – but it quickly became a game of “I spy,” with supermoon ducking behind ridges or winking between trees, only to disappear; to suddenly reappear in the middle of the road – you could almost see the grin on her face. As dawn approached and the Earth somersaulted backwards, towards the east, I saw Sol’s orange glow in the rearview mirror. I knew this tryst was coming to an end but hoped for one more glance across Nantahala Lake. Alas, when I could see westward across the lake, the clouds and fog had settled in the valley and supermoon was on her way to dance in the Rockies, before kissing the Pacific goodbye. ‘Cause they know man’s not there to dampen the dance. If you sleep in it.